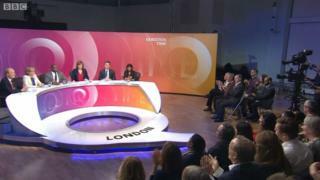 The BBC has been accused of bias after it moved live filming of Question Time from Bolton to London. The programme said Thursday’s show was broadcast from Dulwich to allow politicians attending Brexit debates at Westminster to take part. The weekly BBC One debate, which allows audience members to question a panel of politicians, journalists and public figures, had been due to air from Bolton’s Albert Halls. Others suggested the BBC was guilty of “demographic management” and “bias”. Why did #BBCQT move this weeks program from Bolton to London. Demographic management is such an ugly accusation to make but !!!!! One said the BBC had “dumped” filming in front of a Bolton audience in favour of London because it did not “want to hear their opinion”. Meanwhile Wigan Labour MP Lisa Nandy and Rachel Reeves, the MP for Leeds West, have written to the BBC director general Tony Hall to complain about the decision, arguing it reflects a capital-centric outlook in the corporation’s output and deprived non-Londoners of a voice at a crucial moment in the Brexit debate. The MPs have also asked the BBC to provide a breakdown of how many episodes of Question Time are filmed at state schools and how many take place at private schools, in addition to statistics on the number of programmes broadcast from London. The panel of guests on Thursday included Tottenham MP David Lammy and Culture Secretary Jeremy Wright, the MP for Kenilworth and Southam in Warwickshire, who were joined by journalists and an MEP. The BBC rejected suggestions moving the show was related to the way Bolton voted in the referendum. A spokesman said: “The decision was taken at the start of the week when it was extremely unclear when and if crucial Brexit votes would be taking place. The programme is currently inviting prospective audience members to apply for live episodes due to be filmed in Nottingham on 25 April, Warrington on 2 May, Northampton on 9 May and Elgin on 16 May. It is not due to return to London until 20 June.